The UNSC Cyclops is a devastating assault weapon against Covenant troops, especially at close range. The UNSC Jungle Cyclops is a multi-role exoskeleton equipped for military maneuvers in tropical climates. The UNSC Arctic Cyclops is a multi-role exoskeleton outfitted with arctic insulation and camo for military manoeuvres in sub-zero climates. The UNSC Desert Cyclops is a multi-role exoskeleton equipped for military maneuvers in desert climates. Use all for close range combat with their crushing gauntlets and devastating wrist mounted piledrivers that can easily crush Covenant troops, smash hostile defences, and tear enemy superstructures in half. One supplied; Styles may vary; For ages 8 years and over; Manufacturer’s lifetime guarantee; EAN: 065541970069; WARNING(S): Not suitable for children under 3 years old. 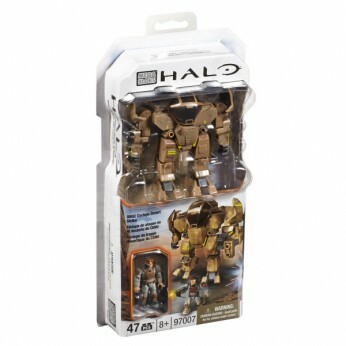 This toy costs approximately £14.99 (for the latest and best prices make sure you check our retailer list for the Mega Bloks Halo Cyclops Battle Assortment above). In our review of Mega Bloks Halo Cyclops Battle Assortment we classed it as being suitable for ages 6 years, 7 years, 8 years, 9 years, over 10 years but recommend you check the manufacturer specific advice before purchasing.